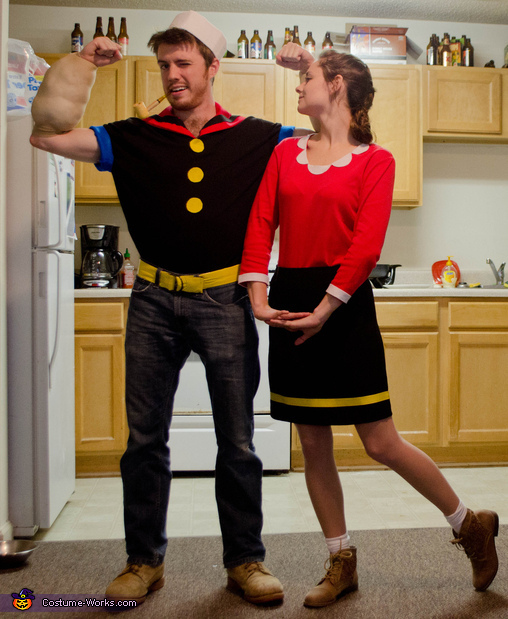 My boyfriend (Popeye) and I (Olive Oyl) hand made this whole costume from scraps of fabric and clothes from our local Goodwill. The idea came from brainstorming. Once we decided a clever couples costume idea we went out the next day to find materials to use! 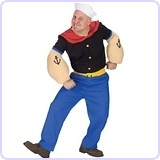 -The clothes came from goodwill and the fabric came from my overly stuffed closet. We just looked at the image and hot glued and sewed piece together until it was complete. -The hardest part was the hat. (They are so expensive online or in a store!) So, we found cardboard in walmarts trash can and got some white canvas cloth material. We measured his head, with a band to go around and two bands that went on the top of his head to get depth. -Then I covered the top with fabric and added a 3 inch rim to it that was also covered in fabric. -The arms: these were his bright idea. Stockings were used and stuffed with pillow stuffing, and that is it! We used two to make sure they kept tight. The belt: This is a belt from Goodwill covered in yellow duct tape. And that is it!! Overall, it took about 10 hours to complete, but we got a whole night full of compliments; totally worth it!